Here comes that brilliant theoretical physicist from The Big Bang Theory! Sheldon Cooper, in retro 1970s style. This EMCE action figure stands 8-inches tall. Features multiple points of articulation and episode-specific inspired clothing! He's a lot smarter than you are! 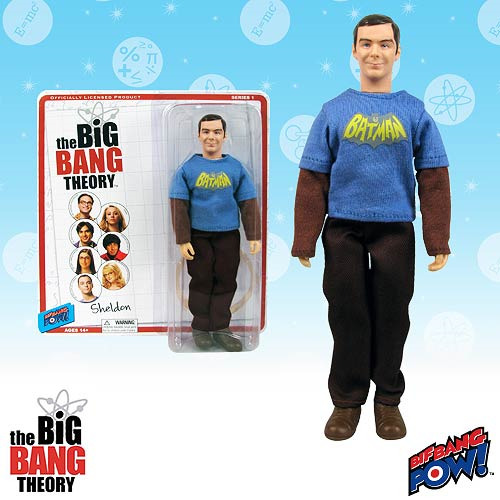 That fan-favorite theoretical physicist from WB's sitcom The Big Bang Theory will wow and entertain you in a retro style that harkens back to the bestselling "Mego" action figures of the 1970s and 1980s in this Big Bang Theory Sheldon 8-Inch Action Figure from Bif Bang Pow!. Sheldon Cooper features multiple points of articulation and stands about 8-inches tall in episode-specific inspired clothing that includes a faded-looking vintage Batman T-shirt with a brown shirt underneath, plus shoes and brown pants. Check out the back of the packaging which features a realistic coffee stain. How original is that? Dr. Sheldon Cooper (Jim Parsons) is smarter than you - and he's not afraid to say so. A theoretical physicist possessing a master's degree, two Ph.D.s, and an IQ of 187, Sheldon is originally from East Texas, where he was a child prodigy, starting college at the age of 11. He has zero interest in romance, as his only real love is science. He is a stickler for routine and is very different from his family; his mother, Mary, is a devout Christian, and his twin sister, Missy, is not a scientist by any means. Superpowers: Eidetic memory, Tuvan throat singing. Weaknesses: Understanding sarcasm, driving. In The Big Bang Theory, Leonard and Sheldon are brilliant physicists - wizards in the laboratory, but socially inept outside of it. Enter beautiful, free-spirited neighbor Penny, who aims to teach them a thing or two about life. While Leonard spends his days looking for love, Sheldon is quite content video-chatting with platonic partner Amy Farrah Fowler or playing Secret Agent Laser Obstacle Chess with their ever-expanding universe of friends, including fellow scientists Raj and Howard, and Howard's new wife, the adorable micro-biologist, Bernadette. Ages 14 and up.